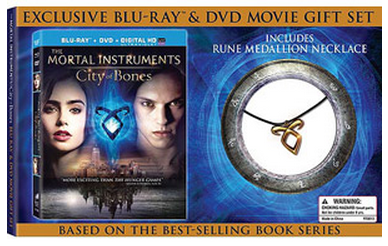 The Mortal Instruments: City of Bones is set to be released on Blu-Ray and DVD this Tuesday in the U.S., and Walmart will be selling an exclusive edition featuring a collectible rune medallion necklace. The Blu-Ray combo pack, which includes Blu-Ray, DVD and digital, is available for $36.88 at Walmart. BUY HERE! When you click to subscribe to email updates you will receive an email for every new post. If you don’t want email updates you can unsubscribe. I wish they were selling the necklace separately as well. Hold on, it’s only in the U.S!? Damn it! I want that necklace!